What was it like to be a child during Nazi rule, and what have children said about their experiences? These are the central questions driving Dr Beate Müller’s impact and engagement project on ‘Children under the Nazis’. Of the 6 million victims of the Holocaust, 1.5 million were children. Countless more who survived were also affected by Nazi rule. And yet, when teaching and learning about the Holocaust and the Third Reich, the focus of attention is rarely on the children: history is made by adults. As a specialist in representations of the Holocaust and World War II, particularly with regard to children, Beate thinks that war children’s testimonies from the early postwar period are often overlooked or sidelined. Beate wanted to create educational resources that would focus on war children, because she is convinced that especially young learners such as schoolchildren will be particularly interested in stories about and by the young. 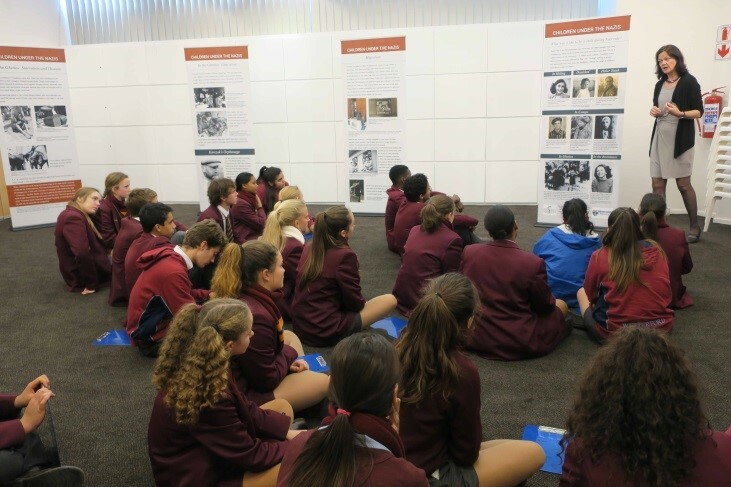 Beate teamed up with the South African Holocaust and Genocide Foundation in order to curate a poster exhibition on children’s lives in the Third Reich. In South Africa, the Holocaust is the only period of European history that is compulsory in the national curriculum, where it is read as an extreme example of racism, discrimination, and genocide. The aim of Beate’s poster exhibition was to illustrate the diversity of children’s lives and fates, using children’s testimonies to provide insight into how the young experienced Nazi rule, be they victims of Nazi persecution or members of the Hitler Youth. Beate included testimonials from the early postwar period. The poster format meant that the written word and visuals dominated over oral sources, although many of the postwar written documents were based on interviews. In liaison with the SAHGF, an interactive educational programme was developed, which is aimed particularly at learners from secondary schools. The project website gives free global access to all teaching and learning materials. A broad range of activities ensued. Funded by two Faculty Impact Fund awards as well as by the School of Modern Languages, Beate spent several weeks in South Africa in the summer of 2017 and in spring 2018, working with staff from the Cape Town, Durban, and Johannesburg Holocaust centres, with teachers and students from local schools, and addressing the public in Cape Town and Johannesburg. Beate was also interviewed for the South African Jewish radio on her public talk about how German schoolchildren remembered the Holocaust in their school essays. Closer to home, Beate’s exhibition was included in Newcastle City Council’s programme for Holocaust Memorial Day 2018; it was on public display in the City Library from 12 February to 11 March 2018. During that time, Beate conducted several public guided tours and a workshop for international students from Sunderland’s OnCampus. Since then, the exhibition and its educational programme have been used by Boldon School for their students of history, by the Newton Aycliffe-based charity DISC (now Humankind) for a one-day workshop with four learner groups facilitated by Beate, and four groups from the Cleveland Police Cadets also used the materials. The exhibition was on public display from 10-25 October 2018 at the Religious Resources Centre in Percy Main where Beate was also the guest speaker at the centre’s ‘Conversation’ event on 15 November. The exhibition will also become part of the North Tyneside Council’s HMD programme for 2019. This entry was posted in Uncategorised by Andy. Bookmark the permalink.